Hanoi (VNA) – Vietnam on October 4 asked other countries to make positive and practical contributions to the maintenance of peace and stability, respecting and fully implementing relevant international obligations, and upholding the law on the seas and oceans. 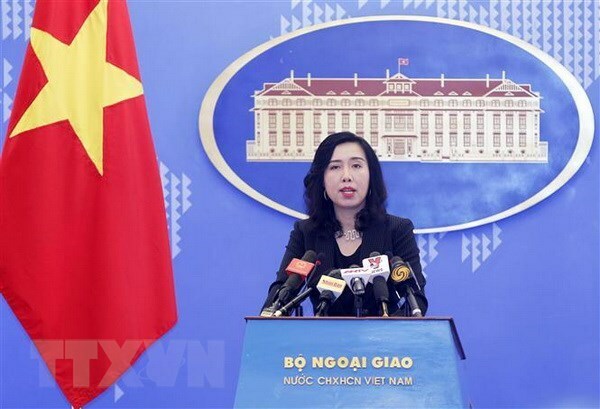 Foreign Ministry’s spokesperson Le Thi Thu Hang made the statement during a regular press briefing of the ministry in Hanoi while responding to reporters’ questions regarding recent developments in the East Sea such as foreign countries’ live-fire drills and US naval ships’ navigation freedom activities. “Once again, we affirm Vietnam’s sovereignty over Hoang Sa (Paracel) and Truong Sa (Spratly) archipelagoes,” she declared. As a member of the United Nations Convention on the Law of the Sea 1982 and a coastal country in the East Sea, Vietnam always respects maritime and aviation freedom in the East Sea in line with the convention, she stressed.